Align, align, align! Well-aligned elements within your layout make your website look tidy and organized. 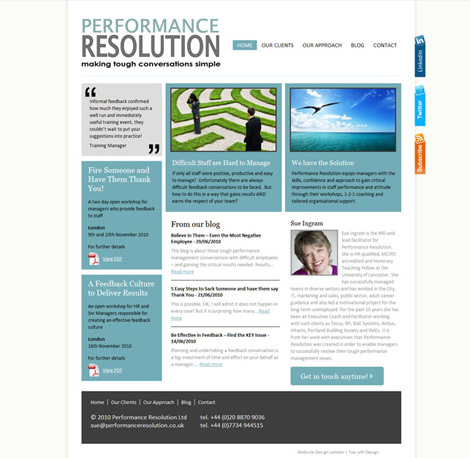 You can see an example of this on the Performance Resolution website. Choosing the right combination of colours in reference to the client’s brief, and referring to the colours of their existing branding, is a difficult and important task in order to create visual harmony within the new branding and website. It’s also good to have some contrast between different elements to highlight important sections of the website, you can do this by using a combination of bright and dark colours, and this can also help to guide the reader through the site. You should highlight things important like the services offered by your company, and keep less important things more simple. 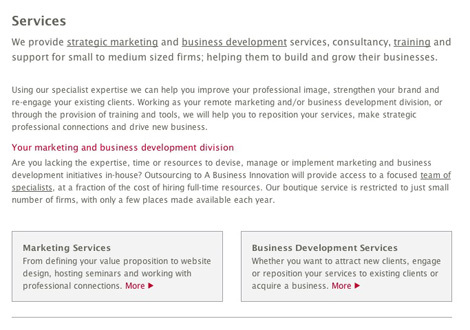 You can see on the A Business Innovation website that there services are highlighted in boxes making this section stand out to people. The website should be consistent, each page should be identifiable as part of the whole. Details are very important in any type of work. It is the same with the design: details are the difference between a good design and great design. When I started working on design layouts, I realised that every final site produced perfectly reflected the final design. This means the margins, padding, backgrounds and borders have to be perfectly consistent through your designs, it’s also important that the colours and fonts stay consistent throughout the site. At the beginning of my internship it was very hard for me to follow these rules, I found it easy to make small mistakes in a layout, such as remembering to make sure everything is aligned exactly, making sure the right colours are used throughout, and ensuring the titles are consistent sizes. And the fact is I didn’t understand why it was so important because by definition, it was only small details… But now I know why. The most obvious: The work looks more professional, if you always make small mistakes your reputation will suffer. You don’t waste time explaining these little mistakes when the client is viewing your designs. Everything is perfect and so you can focus spending time discussing the things that really matter. It makes you more organized. If you’re organised and have named each of your layers in Photoshop, and grouped these into folders it means when you come to making small changes you save a lot of time. Naming your layers in Photoshop is really important when you are working in a team as it’s not only you that will be working on those files. Faster development. For example if you design a blog which is not correctly aligned and you send it off to the programmer to be built, the programmer doesn’t have to waste time figuring out if you made a small mistake or if it was intentional. This tip is linked to my previous point. The final design has to be perfect to avoid a dissatisfied or disappointed client. Everything is double checked to be sure the result is as expected. Sometimes when you work for a long time on a design you can’t detect mistakes easily. That’s why it’s important to have someone else in the team to take a look over the design, and see if there are any little tweaks which need to be made. A design can look sophisticated and professional without many design elements which may just prove to be useless. Personally when I’m looking through a website for information about a company, I prefer to see a clean and minimalist design where it’s easy to find what you want, and not be distracted by things that are not as important. Nice piece Julien. Sounds like your internship was a rewarding and lovely experience. Julien was part of our French students duo in the summer of 2011. He spent 10 weeks with the team at Top Left Design on a summer internship. He was particularly interested in Wordpress and coding, as well as design layout work.